SME Chamber of India (India’s leading National Premier Chamber) has collaborated with MRSS India Ltd. to launch a study to measure the “SME Business Confidence Index” for India. The research titled “SME CONFEX 2016” is the first sentiment measuring mechanism of its kind to be conceptualized. The formal inauguration and launch of the Index was held on 19th August at Sahara Star, Mumbai, on the occasion of the SMECOI FOUNDATION DAY. The event was graced by dignified guests such as Shri Ch. Vidyasagar Rao (Hon’ble Governor. Maharashtra) ; Shri Subhash Desai (State Minister for Industries) ; Shri Rajeev Kumar Agarwal (Whole Time Member,SEBI ); Shri Deepak Kesarkar (Minister of State for Home, Planning & Finance) ; Shri Arun Tiwari (CMD, Union Bank of India) amongst others. 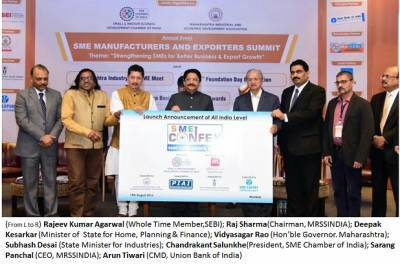 The SME segment, considered the backbone of the economy, is the key segment of focus for not only the Government but also the Industries and Administrative bodies. This Index designed by MRSS and SMECOI will aim to “measure”, “monitor” and “manage” this segment, which serves as the driving force of the economy. The multi-million dollar multi-year research would cover an extensive base of more than 6500 SME companies across the country and provide a genuine yardstick for the measurement of the prevailing SME sentiment and their future outlook. Star Gold brings you a laugh riot that will take you by storm!